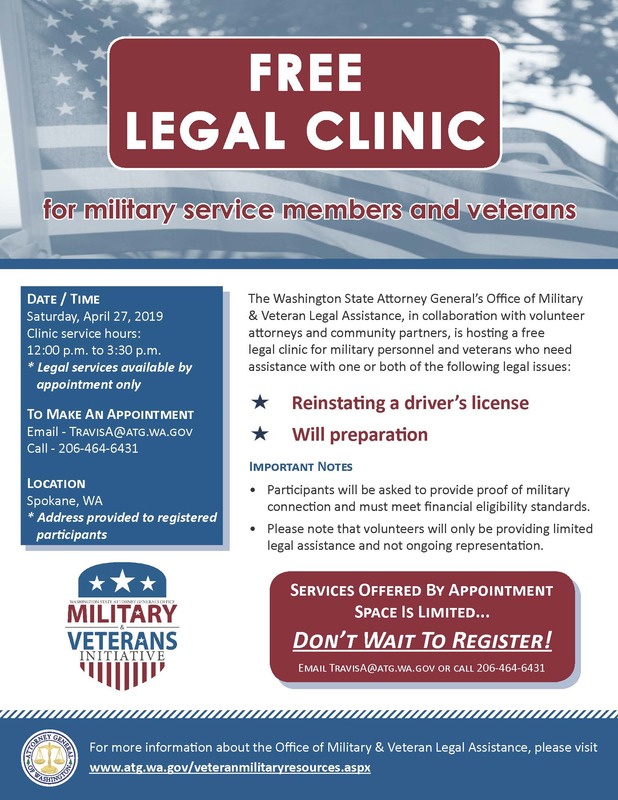 The Attorney General's Office is hosting a FREE LEGAL CLINIC in Spokane on Saturday, April 27, 2019 for miltiary personnel and veterans who need legal assistance with one or both of the following legal issues: 1) Reinstating their driver's license, and/or 2) Will preparation. We are currently recruiting both volunteer attorneys and prospective clients with current or former military service. Clinic legal services are offered by appointment only. Space is limited so don't wait to register! You can make an appointment or sign-up to volunteer by calling the Attorney General's Office at 206-464-6431 or emailing travisa@atg.wa.gov. Prospective clients will be asked to provide proof of miltiary conection, must meet financial eligiblity requirements, and must be domiciled or stationed in Washington State. Other terms and conditions may apply. Volunteers will only be providing limited legal assitance and not ongoing representation. The Attorney General's Office is proud to support Washington's military service members, veterans, and their families. These proud Americans have done their part to honor and serve our country—and it's only right to honor and serve them in return. 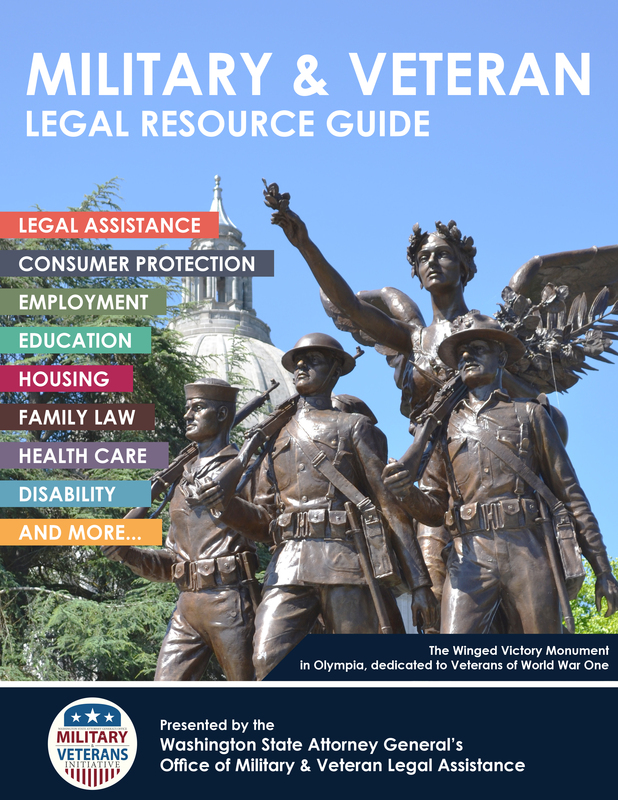 The Attorney General's Office of Military and Veteran Legal Assistance is actively working in collaboration with partners across the state to connect Washington's military service members and veterans to legal services and resources. The Attorney General's Office is also working to increase the availability of civil legal assistance programs specifically focused on helping the men and women who have served our country in uniform. Military service members and veterans deserve to receive the full slate of benefits and protections they have earned. Federal and state laws extend certain rights and benefits to veterans and service members, including, for example, laws to help avoid credit and foreclosure problems, and laws to protect against discrimination in employment and housing. Veterans and service members may also be entitled to healthcare, education, and other benefits. To receive periodic updates from the Attorney General about legal resources for military veterans and service members, add yourself to Attorney General Bob Ferguson's email update list and check the "Veterans Newsletter" box.